We were still in vacation mode and I was too lazy to cook that Sunday we returned so we headed to the Indian restaurant located in a trip mall in Chelmsford. Parking was easy and the restaurant was quite empty when we arrived at noon. We were quickly seated by a booth near the buffet stations. The decor was modern and the ambiance is great. There were Indian adorning but not as intricate and overwhelming as other restaurants that boasts purple and gold paintings on walls that sometimes can appear cheesy. The food area was very clean and the menu items were well labeled. It was definitely a step up than what we were accustomed to in our Lowell restaurant. There were the usual staple dishes that the Mo loves such as chicken tiki masala and chicken biryani rice dish. My favorite dish was the fish koliwada, which is a Bombay style masala fried fish garnished with fresh herbs and lemon. 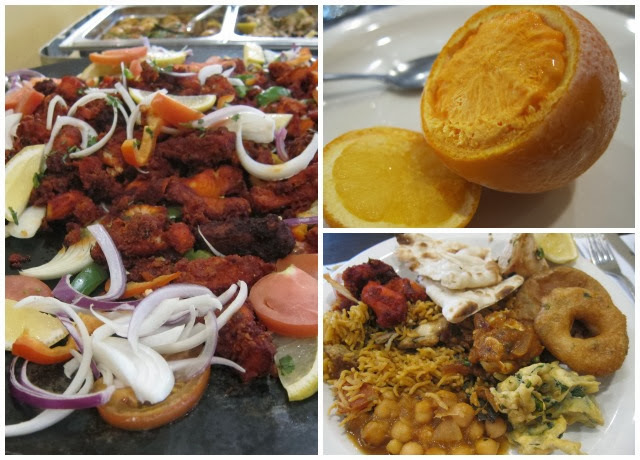 I've never had it in any of my other Indian buffet experiences, usually just the tandoori chicken is served. I was slightly disappointed that there were no korma dishes but there were a variety of vegetarian dishes with eggplants, okra and lentils to satisfy many customers. Service was a bit slow as we had plates of dishes piled on our table and our water glasses were empty for most of the time. I'm usually too stuffed to try any Indian desserts and I'm not a fan of the usual offerings of Indian rice pudding or gulab jam, fried cheese balls soaked in syrup. One thing that did catch my eye were the frozen orange kulfi, homemade ice-cream made with condensed and evaporated milk. The orange kulfis were beautifully presented in an intact orange shell with just the top missing. The creamy dessert was a great ending to a delicious meal. As we were leaving, the restaurant quickly filled up with other Indian families. At one of the table, some of the teenagers were wearing Exeter hoodies, one can assume they traveled quite a bit to dine at this establishment. Pricing for the buffet is a bit more than the surrounding areas at $14.99 a person + tax. Overall, I would definitely visit again. It was a great meal.